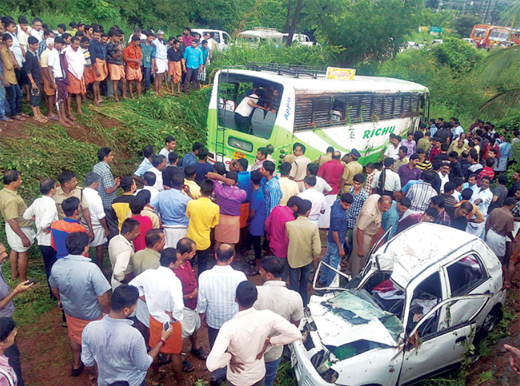 Kasargod, Aug 24, 2015: An ex-serviceman and his wife lost their lives while as many as 18 persons were injured in a car-bus collision at Mavungal near Kanhangad on August 23, Sunday. The deceased are Suresh Babu (39) and his wife Sudhamani (35) of Vellarikundu. The couple’s son Gopinath (12) who was seriously injured in the mishap has been admitted to a private hospital in Mangaluru. The mishap took place when the bus operating on the Panattur-Kanhangad route hit the car heading towards Vellerikundu. The deceased Suresh Babu was serving the BSF while Sudharani worked for a private bank. Hosadurga police have registered a case.